So, what do you think? 'Yay' or 'nay' to this gold skirt? omg love this outfit! so cute! love your oufit here! especially the color of your tights! mmm I do not like the skirt..but the outfit you created it's nice! Happy birthday to your brother and friend! Skirt gets a big YAY from me, it's very cute! love this gold skirt, so cute! gold, leopard and leather...a few of my FAVE things! super cute outfit! wanna follow?! 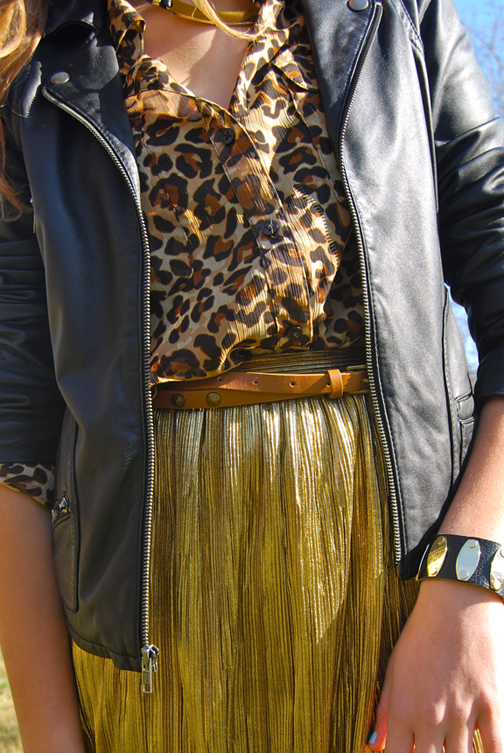 love the leopard blouse and gold skirt!! I like the leopard and gold combo! This outfit is perfect. Love the gold with the leopard print. Ahh that skirt! It's like the tin man suddenly turned female and got fashionable! Love the skirt! And I also really like how you added the brown tights. It adds a whole new dimension to the outfit! Really nice skirt on you and cuffs! i love the skirt! completely a "yay". now following you!! this actually made me laugh....in front of like ten people in a library. I wish I had that analogy before I made this post and I certainly would've included it! love that skirt! so pretty!! So pretty! That skirt is just SO amazing! Love it. Haha, mom sometimes makes a questioning face at me in some of my outfits too. Ah well, we're the ones with a fashion blog! it does! it's such a statement piece :) thanks for the sweet comment! nice outfit and great blog! I just love your skirt and accessories are amazing!!! OMG! I'm in love with your gold skirt!!!!!!!!! I love your gold skirt worn with that gorgeous animal print top and brown tights, but I don't think that the leather goes with it. They're seem to be of two different themes. One screaming 'safari' and the other saying 'biker girl'.